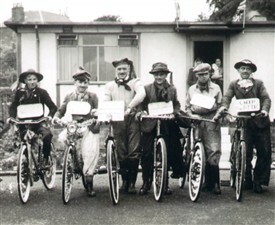 Fancy dress bicycle competition in front of prefabs at Preston Park, Linlithgow, 1950s. Much of the content for the Addiewell Heritage website was sourced at the Local History Library. This page was added by Sybil Cavanagh on 02/07/2012.